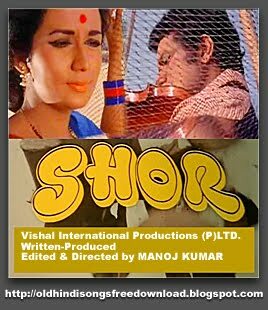 Free Download Shor 1972 Songs: Shor was released in the year 1972 and performed outstanding business in the boxoffice of that year. Manoj Kumar was the show man of the movie. He written, produced, directed and edited the movie. He bagged theFilmfare best award, in the category of editing. The movie produced some ever green songs like “Ek Pyar Ka Nagma Hai” sung by Lata Mangeshkar and Mukesh. He was nominated for the best singer category for Filmfare. The music was composed by – Laxmikant Pyarelal. The playback singers who were fortunate to sung songs for the film was Lata Mangeshkar, Mukesh, Manna Dey, Mahendra Kapoor and Shyam Chittar.